The U.S. Supreme Court ordered the 8th U.S. Circuit Court of Appeals to reconsider a North Dakota lawyer’s First Amendment challenge to a nearly 30-year-old North Dakota law that obligates lawyers to to become members of a state bar association. Currently, 37 jurisdictions require bar membership as a condition to practice, with North Dakota being the first to do so. 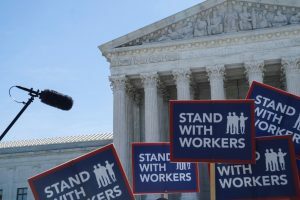 The high court ordered the federal appeals court, which upheld the requirement in 2017, to reconsider after this past summer’s Janus vs. AFSCME decision. North Dakota lawyer Arnold Fleck says that being compelled to become a member of the bar violates his First Amendment rights, and asked the Supreme Court to overturn a precedent set in 1990 that said that compelled memberships don’t require members to finance political or ideological activities. Fleck argues that rule requires him to opt out, rather than opt in, to the dues that aren’t related to his ability to practice law.